Romeo is the one on the left,with Juliette doing the strike. This is Sunset Point . You can see somebody sitting down up in the top left. They looked like they were just taking it all in. Waves are constantly hitting this point and the explosions can be very large! You can also see “Long Beach Lodge Resort” in the background. Many people come up here and just walk around our beautiful beaches! These two were wading through this lagoonal like pond on Chestermans. I waited for a wave to crash onto Sunset Point in the background. 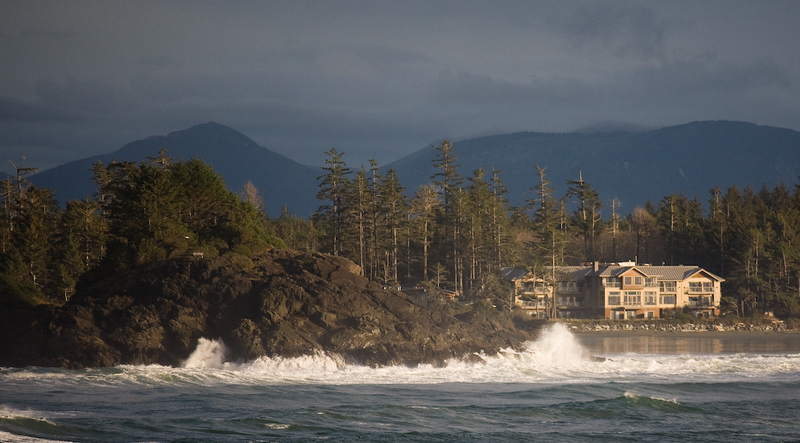 You can also see Long Beach Lodge Resort in the background. I didn’t go out tonight in my boat. There were too many clouds. However,it did get nice a hour or so before sunset. The sun came out of a large cloud and it got sunny gold all over. I did see it was going to happen and had enough time to ride out to Chesterman’s Beach. The moon did come up in the east,but there was too many clouds blocking it near the horizon. It came out from the clouds well up into the sky. I got a few shots tonight,but nothing remarkable.